Buchanan was generally the number two running back on the teams he played for, but not so much the second fiiddle as the fleet counterpunch to the bruising fullbacks of his day. Buchanan started his CFL career with Calgary, and played two season there providing the complement to Earl Lunsford. 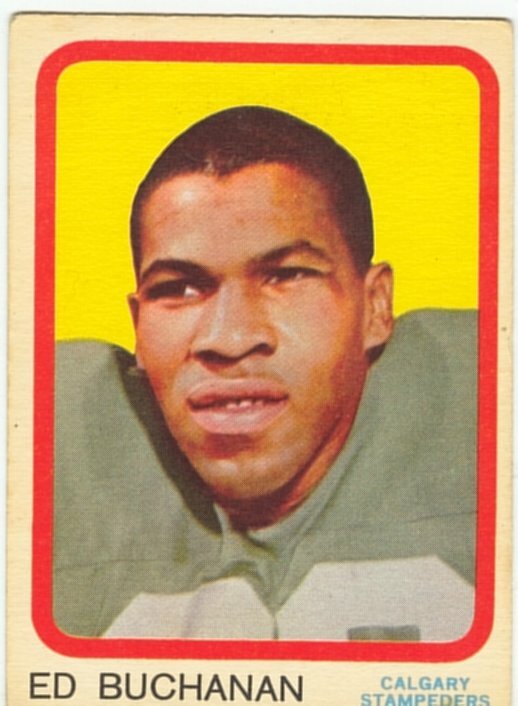 In 1961, Buchanen ran for 348 yards with a 7.7 yard average carry in his rookie season. Seeing more touches in 1962, Buchanan had 824 yards rushing and a 6.0 yard average. In 1963, Buchanan moved to Saskatchewan and there teamed up with George Reed for the next five years from 1963 to 1967. Buchanan's best season came in 1964 when he rushed for 1320 yards (more even than Reed) and 36 passes for another 681 yards. Those statistics earned Buchanan both Western and All-Canadian All-Star spots in 1964. Injuries limited Buchanen to just 4 games in 1965 and 6 games in 1966, but he he will always be remembered fondly in Saskatchewan for being a member of that club's first Grey Cup win in 1966. A healthy Buchanan played all 16 games in 1967, rushing for 695 yards and catching 33 passes for another 471 yards. After not playing in 1968, Buchanan returned to action with Hamilton for two season in 1969 and 1970. In total, Buchanan ran for 4857 yards in his career and was also a major threat catching the ball and returning kickoffs. If you look at Buchanan's average gain per pass reception, his lowest average for any season was 13.2 which is truly outstanding for a running back and in three seasons, his average was over 20 yards per catch. Ed Buchanan passed away from Lou Gehrig's Disease on August 31, 1991. Games played statistics were not kept in the West until 1964.